With his declaration as Senator elect for Zone A, Benue North East senatorial district in the February election, former Benue governor, Gabriel Suswam has moved fast to establish his political supremacy in the State. According to results released by INEC, Suswam polled 148, 645 votes to defeat incumbent Senator, Barnabas Gemade of Social Democratic Party (SDP) who emerged a distant third position with 32, 534 votes and All Progressive Congress (APC), Mrs Mimi Adzape-Orubibi who also came a distant second with a total vote of 81, 603 votes. Also, a candidate of the All Progressives Grand Alliance (APGA), former Senator, Joseph Akaagerger, scored 8, 099 votes to emerge the fourth position in the race. But both the incumbent Senator, Barnabas Gemade of the SDP and Mrs Mimi Adzakpe- Orubibi have challenged the results announced by INEC on the grounds that Suswam’s victory is a product of mass rigging. Both have headed to the Tribunal to challenge the INEC declaration. Gabriel Suswam has also responded. His new game plan is to tackle his two closest rivals individually, independently and differently. Information available to this writer from sources close to Suswam indicates that he does not take the challenge by Barnabas Gemade as a serious issue. He believes that Gemade, former National Chairman of the PDP during the Obasanjo years is a political dead horse not worthy of any place in his new game plan. “Gemade was not even the one that came next to me according to the result. He came a distant third. I congratulated Gemade when he defeated me in 2015. So, I expect him to follow suit by congratulating me,” he said at the INEC office in Makurdi immediately the results were made public. The challenger that worries Suswam, this writer gathered, is Mrs Mimi Adzakpe Orubibi who comes from the Kwande axis. This axis believes that it is their turn to produce a Senator for the district. Already, according to information available to me, the Senator elect has reached out to Mrs Orubibi in an attempt to persuade her to withdraw her petition against him. 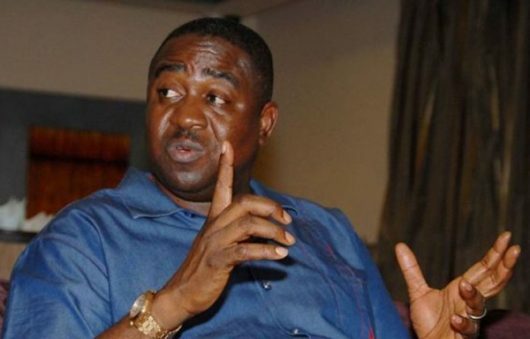 The sources confirm that Suswam has offered a huge sum of money to Mrs Orubibi to cover her campaign expenses and even more, if she withdraws her case at the Tribunal. “Suswam is also offering to use his connections at the National level of the APC to help the lady secure a Ministerial slot as part of the deal”, the sources told this writer. However, Mrs Adzakpe Orubibi remains unconvinced about Suswam’s new offers to her. Sources close to her confided to this writer that she is not very convinced about Suswam’s influence at the National level of the APC to secure a Ministerial position if she drops her case against him. The discussion in APC circles both at State and National levels is that Suswam had deceived the APC National Secretariat prior to the gubernatorial election in the state. “After Suswam’s election, he deceived our national leaders that he was prepared to drop Governor Samuel Ortom and work for the APC governorship candidate, Barrister Emmanuel JIme in the gubernatorial contest. He did not fulfil that promise instead he worked for Ortom’s reelection. We do not trust him and we do not think the national leaders of our party trust him to the extent that they will accept a Ministerial candidate nominated by him”, a close source to Mrs Orubibi told this writer. Suswam’s new chummy relationship with Governor Ortom will continue to haunt him both at the local and national level according to authoritative sources on the politics of Benue State. At the local level, most of Suswam’s supporters were said to be of the opinion that Ortom’s performance as Governor of Benue state was so poor that it was politically suicidal for Suswam to support his reelection. Apart from his poor record of performance – none payment of salaries and no project execution – Ortom was seen by Suswam’s followers as their tormentor and worst enemy. They point out to the fact that when Ortom came to power in 2015, he embarked on a probe of the activities of the Suswam government which amounted to a ‘witch hunt’. “Suswam was accused of stealing over N100 billion from the coffers of the Benue State government by the Ortom administration. His associates and those who worked in his government stood accused as collaborators in this massive, unprecedented and landmark heist in the history of Benue. Many of them have cases either with EFCC, ICPC or the courts”, one of Suswam’s supporters complained. He said because of these reasons, they were not enthusiastic about their leaders support for Ortom’s second term bid. At the national level, his decision to renege on his promise to ditch Ortom in his reelection bid will make it difficult for him to be trusted again. This is so because Ortom has a very poor working relationship with the Federal Government led by President Muhammadu Buhari. His frequent, unprovoked and loud tirades against Buhari has made him personal-non grata in the inner circles of power in Abuja. Anybody who helped him to secure a second term in office is most likely to be seen as an enemy of the President and his government. Unknown to those at the local level in Benue and also at the national level who had hoped that Suswam was going to back Jime against Ortom, the man had reached a secret agreement with Ortom over the election. In the new deal which insider sources confirm to me was brokered by two former Senate Presidents, viz; Senators David Mark and Iyorchia Ayu with a former Minister, Abba Moro in attendance, Suswam was made to swear allegiance to Ortom. “In return for this oath of allegiance, Ortom was also made to swear that all properties seized from Suswam by his government would be returned to him. Ortom was also made to swear that all cases against Suswam at EFCC or in the courts would be frustrated in the new spirit of collaboration,” the source revealed. It was further revealed that both Senators Ayu, Mark and Abba Moro promised to help Suswam displace Senator George Akume as the political leader of Benue state if he supported Ortom in his second term bid. “At that meeting, it was further resolved that Suswam should be sponsored to emerge as the Minority Leader at the Senate. This will make him become very visible at the national level and thus whittle down the visibility which Akume appears to enjoy with the Buhari administration,” the source revealed. Going further, multiple sources confirmed that the whole grand conspiracy between some political actors in Benue State in the last election was the morbid fear and jealousy of Senator George Akume. It was gathered that these political actors mostly in the PDP were scared of Akume. They reasoned that not only did Akume rule Benue as Governor for two terms, his election as a third term Senator had raised his political profile so much that he was appointed the Vice Chairman (North) for Buhari’s reelection campaign during the last election. It was this fear that informed the gang up against the APC and Akume in the 2019 elections in Benue. Mailafiya resides at Number 54 Doma By pass, Lafia, Nasarawa State.